Philips, a leading automotive lighting innovator, introduces a new product to the successful Vision Plus range. Philips Vision Plus signalling bulbs provide 50% more reaction time to the driver behind to brake, as a result of a brighter & faster lit-up braking light. Ultimately, the driver behind has approximately 3 meters more braking distance at 100 km/h. 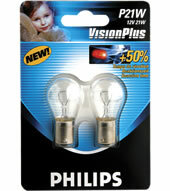 Philips technological “know how” developed the VisionPlus signaling lamps with a new gaseous mixture inside which enables thicker filament to light up quicker without burning up more energy or shortening the life of the bulb. Upgrade your signalling bulbs to improve safety on the road and reduce the risk of a rear end collision.